Functional Performance Testing (FPT) is the process of putting the Direct Digital Control (DDC) system through its paces by manipulating every possible condition the HVAC controls and equipment will ever experience. FPT is an important part of the building commissioning process. 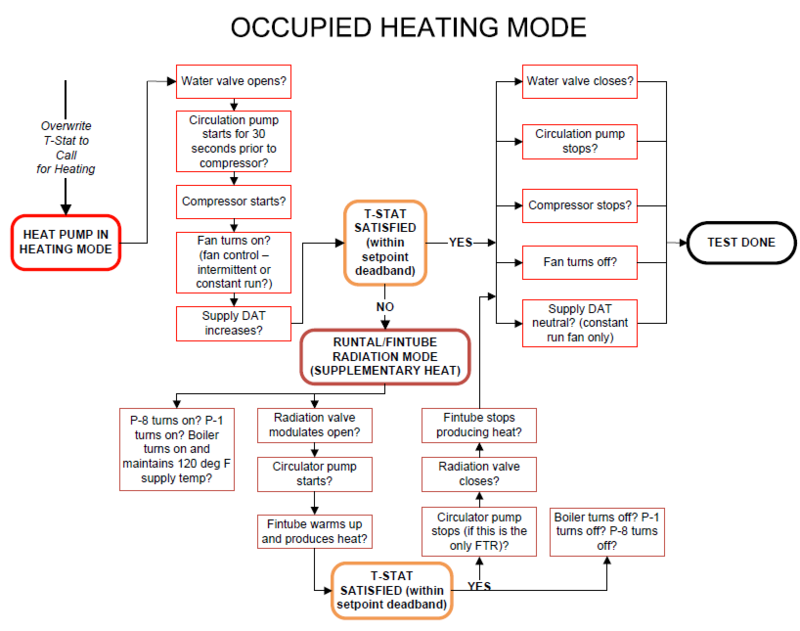 Only by testing how the DDC system controls respond to switching from cooling to heating or economizer mode, occupied to unoccupied mode, satisfied to unsatisfied temperatures, or normal power to emergency power, can the building owner know the system will function properly when the contractors leave and the building is handed over. The tests force you to work through the controls sequence language created by the design engineer in a sequential order. FPT allows us to better understand the "brains" behind why equipment performs and reacts as it does. To make sure a piece of equipment works as intended and can provide the expected performance is the main reason to functionally test HVAC systems. Functional performance tests are created by using a workflow diagram: start with the systems running and change setpoints or fail components to see how the system responds. Does the backup pump turn on when we manually disconnect the main pump? Does the chiller turn off when we manually overwrite the water temperature below the chiller setpoint? Does the emergency power turn on all of the equipment if the building experiences a power failure? The tests are written to walk through the design engineer's controls sequences step by step and ensure the components are responding as designed. When you start picking apart the control sequences to create these tests and then perform the tests in the field, there is a lot of opportunity to find potential issues that could affect the overall performance of a system. The issues can vary in severity, from a small change in the programming of the system, to a larger scale item in which a piece of equipment or component can't perform the way it was intended. Issue: An exhaust fan sensor wasn't working correctly and prevented the fan from turning on when intended. The sensor was fixed and the equipment was retested successfully. Repercussion: The fan wouldn't turn on, therefore inhibiting air from being exhausted out of the space. Issue: The CO2 sensors, which control the amount of fresh air being provided into spaces, were not calibrated correctly and were reading very high false levels. The sensors were fixed in these spaces to read more accurate CO2 levels. Repercussion: The heat pumps and energy recovery units were operating unnecessarily to provide fresh air to unoccupied spaces. Any energy savings attributable to the CO2 sensors were not being realized. Issue: The pumps for the ground source system were starting up when any heat pump in the building started, even though the building loop temperature was within its proper range and no temperature conditioning was required. The controls sequence was reprogrammed and retested successfully. Repercussion: The pumps were turning on unnecessarily, therefore decreasing the lifetime of the equipment and increasing energy consumption. If functional testing isn't performed, issues such as the examples above may have never been noticed. All system types can generate different issues and functional performance testing offers reassurance to the building owner that your systems are working correctly and as intended. In future blog posts, I will look at how this testing can also provide opportunities for energy savings as well as explain the different system components that this testing checks.